Do you find that you easily meet people for dating, but you do have difficulty finding the right person who wants what you do out of life? Do you find yourself staying in exclusive relationships way too long that don’t lead to marriage? Coach Amy works with marriage-minded individuals who are ready to take charge of their dating efforts and learn a system of how to meet people who share their values so they can meet the right one and have the family life they desire. Amy’s story is one of perseverance. She was divorced in her mid thirties and wondered just like you do, “Will I ever meet someone to marry?”. After working with a relationship coach, she met her husband and remarried at 42. Unfortunately, they struggled with infertility until giving birth to her son at the age of 48 after exploring all her options to bring a child into her family. Increase the opportunity for a love connection with the “right one” based upon shared key relationship values to find lasting true love. 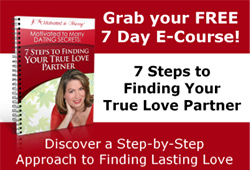 Create a targeted, effective dating plan so you can finally find your true love and live life doing what you truly love. Become more self assured so you feel attractive to others. Save precious time by learning how to evaluate a potential partner quickly and accurately so you don’t spend time in a relationship going nowhere or eliminate an appropriate mate. Provide a way for you to remind yourself of all the wonderful attributes you have to offer to a loving relationship so you won’t lose hope while you are looking for that special person. People who have made finding a serious committed relationship a priority in their life and are willing to put their energies and resources to achieving this goal. Actively seeking accountability and support for their actions to create opportunities for meeting that special person. Dedicated to learning a new approach to dating and relationships to fully realize their dream of having a life partner, marriage and the family they desire. Learn about Coach Amy’s Coaching Programs and Products.